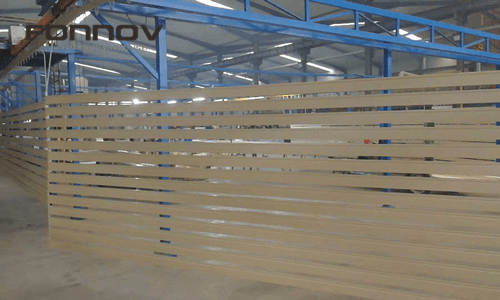 Fonnov PVDF Coating Process on aluminum. PVDF coating (a fluoropolymer product containing 70% polyvinylidene fluoride resins) has excellent resistance to fading, anti-blooming, anti-air pollution (acid rain, etc. ), strong UV resistance, strong crack resistance and ability to withstand harsh weather conditions. Therefore, PVDF coated aluminum and aluminum sheets are mainly used in windows, curtain walls, and buildings in offshore areas. Before coating the aluminum, the surface of the aluminium piece should be degreased and chemically treated to creat a chrome film, which help to increase the adhesion and oxidation resistance of the coating and the aluminum surface. A primer coating can improve the coating’s resistance to penetration, enhance the protection of the substrate, stabilize the metal surface layer, and enhance the adhesion of the top coat to the aluminum surface. The thickness of primer coating is generally 5-10 microns. The color top coating is the key layer of the spray coating. It provides the decorative color required for the aluminum to meet the design requirements and protect the metal surface from the external environment, acid rain and pollution. The color top coating is the thickest layer of paint in the spray, generally 25-30 microns. The main purpose of the clear top coating is to more effectively enhance the lacquer coating’s resistance to external erosive, protect the color coating, increase the metallic luster of the coat color, and make the appearance more vivid and brilliant. The coating thickness is generally 10-15 microns. 3 Coat process generally requires two times curing. The curing temperature in the oven is generally between 230°C and 250 °C, and the curing time is generally 10-15 minutes. Different PVDF coating manufacturers will have their own instruction on curing temperature and time. Some coating plant adapts one time curing according to their own experience. For 2 COAT process, there’s a little difference from 3 COAT process. 2 COAT process is followed by a color top coating after primer coating, and it only require one time curing. PVDF Coating manufacturers generally can guarantee a coating life of 20 years or even 30 years. 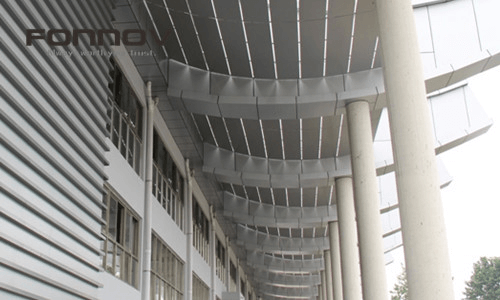 Also , FONNOV ALUMINIUM should emphasize that high-quality paint materials, proper production process, strict quality controlling, as well as regular effective maintenance on PVDF coated aluminum final product are all essential factors for long-term weatherability.